Warning: spoilers for the Season 2 finale of The Flash ahead. Season 2 of The Flash has come to an end, and that crazy cliffhanger is one that has the potential to uproot pretty much every single thing that has happened in The CW’s DC universe since Arrow premiered in 2012. Barry Allen went back and meddled in his own past, and so the timeline has been changed in a very big way for what comes next on The Flash. Due to the nature of the Flarrow-verse, the finale left us with the big question of how the timeline changes will affect Arrow. According to star Stephen Amell, the crazy fantastical Flash cliffhanger won't necessarily mean the same kind of craziness for the more grounded Arrow. I don’t know. I do know that we’ve done a lot of work on Arrow to introduce the other shows, for lack of a better term, and now that that’s all done, we’re focused on doing the things that we do well for Season 5. Stephen Amell’s reveal to Comicbook.com that Season 5 of Arrow will be about Arrow, rather than dealing with setting up the events of the rest of the Flarrow-verse, is pretty fabulous news for fans who have been itching for a return to some of the realism of earlier years. 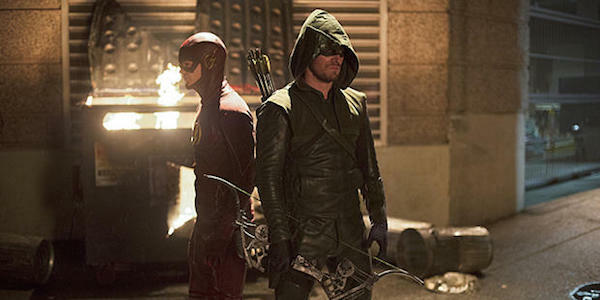 Barry’s rather short-sighted decision to change the course of events that led him to become the Flash technically has the potential to change everything that has happened on Arrow at least since Barry dropped by in Season 2; Arrow changing its narrative to accommodate a Flash plot twist would be unfair to fans who prefer Oliver’s journey as the Green Arrow to Barry’s adventures as the Flash. Arrow certainly has sacrificed some of its realism to prepare characters for spinoffs. The heavy lifting for Legends of Tomorrow happened over two seasons on Arrow, and The Flash was already fantastical enough that Legends elements didn’t require much of a departure from the norm. Luckily for those of us who are ready for Arrow to be about Arrow regularly again, Stephen Amell has encouraging words. Arrow is at its best when we’re dealing with problems in Star City. We’re not a time-travel show, we’re not a multi-Earth show, though obviously [we do that] with crossovers and stuff like that. We’re Arrow, we deal with Star City, and I feel like we’ll be better off focusing on that. Stephen Amell has already said that he expects an Arrow/Supergirl crossover at some point, and CW bigwig Mark Pedowitz has confirmed that the annual crossover extravaganza will involve all four DC shows. Arrow definitely sticks out as the show without superpowers, and the contrast between skills and superpowers was part of what was so entertaining about the earliest crossovers, so it should be fun to see how an Arrow-focused Arrow in Season 5 will affect the less grounded shows in the major crossovers. If Arrow has to be an island (not in a flashback) in The CW’s DC empire to get back to its roots, the network’s entire comic universe may be better off. Check out our breakdown of what we know so far about Season 5 for a peek of what’s to come for Arrow next fall, and take a look at our summer TV premiere schedule to see what you can watch in the meantime.